There are 70 Assisted Living Facilities in the Menomonee Falls area, with 5 in Menomonee Falls and 65 nearby. The average cost of assisted living in Menomonee Falls is $3,150 per month. This is lower than the national median of $3,346. To help you with your search, browse the 199 reviews below for assisted living facilities in Menomonee Falls. On average, consumers rate assisted living in Menomonee Falls 3.5 out of 5 stars. Better rated regions include Germantown with an average rating of 4.1 out of 5 stars. Caring.com has helped thousands of families find high-quality senior care. To speak with one of our Family Advisors about assisted living options and costs in Menomonee Falls, call (855) 863-8283. Menomonee, Wisconsin, is located 17 miles northwest of Milwaukee and is home to nearly 40,000 people. Senior citizens comprise nearly one-fifth of those living in the village. In Menomonee Falls, seniors can choose from five assisted living facilities within the city limits and 55 a little farther away. Across Menomonee and throughout Wisconsin, there are four types of assisted living facilities (ALF) and programs, known as adult day care, adult family homes, community-based residential facilities and residential care apartment complexes. The Wisconsin Department of Health Services oversees the licensure and regulation of the four types of ALFs. The Menomonee Falls area is served by the Milwaukee County Transit System. Seniors who choose to take public transportation in Menomonee Falls qualify for reduced fares and those who meet the income restrictions are eligible for the GO PASS (unlimited rides). If the average cost of living across the United States is scored at 100, Menomonee Falls' cost of living receives a score of 114, considerably more expensive. Seniors who live in the area will find average housing costs considerably higher in Menomonee Falls and average grocery costs cheaper than Wisconsin and the nation as a whole. The overall crime rate in Menomonee Falls is around 56 percent lower than the country's average crime rate. This means there are around 452 crimes reported annually in Menomonee Falls. Seniors could consider moving to the area for its low violent crime rates, with an average of zero murder cases reported each year. Menomonee Falls has an array of community resources for seniors, including the Menomonee Falls Senior Center, an organization that offers a variety of services and activities including art classes, recreational programs and health information. The Menomonee Falls area is home to world-class medical facilities, including Froedtert Community Memorial Hospital, in the event of medical emergencies or illness. Wisconsin, like the rest of the Midwest, experiences freezing winters that can dip as low as -5 degrees. Seniors who dislike the cold or snow will not enjoy Menomonee's average snowfall rate, which is 17 inches higher than the national average snowfall. Assisted Living costs in Menomonee Falls start around $4,207 per month on average, while the nationwide average cost of assisted living is $4,000 per month, according to the latest figures from Genworth’s Cost of Care Survey. It’s important to note that assisted living rates in Menomonee Falls and the surrounding suburbs can vary widely based on factors such as location, the level of care needed, apartment size and the types of amenities offered at each community. 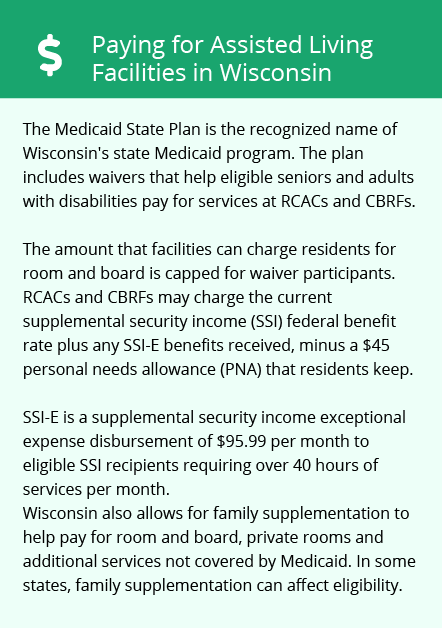 Eligible seniors in Menomonee Falls can receive additional Social Security income to help pay for assisted living through Wisconsin's Exceptional Expense Supplement for Members of Supplemental Security Income (SSI) program. 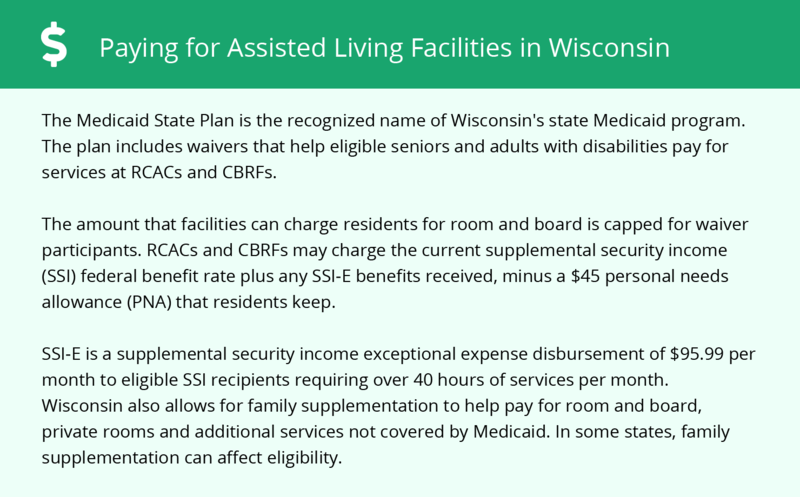 Additionally, Medicaid's Medical Assistance Personal Care program is available to seniors residing in ALFs with less than 20 residents within the state. To see a list of free assisted living resources in Menomonee Falls, please visit our Assisted Living in Wisconsin page. Menomonee Falls-area assisted living communities must adhere to the comprehensive set of state laws and regulations that all assisted living communities in Wisconsin are required to follow. Visit our Assisted Living in Wisconsin page for more information about these laws.